This entry was posted in English and tagged Bible, timeline. Bookmark the permalink. what a helpful tool for us to use! Thank you again, Mark!! Fantastic! Would I be allowed to use this as a teaching aid for a subject called “Introduction to the Bible” that we are running at out church? Absolutely, Tanya. Please let me know, if you have any suggestions to improve them! Talk about timing, I am just about to do a Bible overview to set some context before we start looking at Nahum at youth group this week. And here you have done these time line cards. Brilliant. Thanks so much, In Christ, Ben Cosford. Wow!! This is tremendous! Wish I had these a few months ago for my Bible Survey class!! Glad to have discovered your work, Mark! Great stuff!!! Thanks Fred. The cards are actually 6 years old, but I only just put them up. Sorry about that! Hi Mark, I really appreciate the effort and accuracy of your work in relation to the historicity of the Bible. 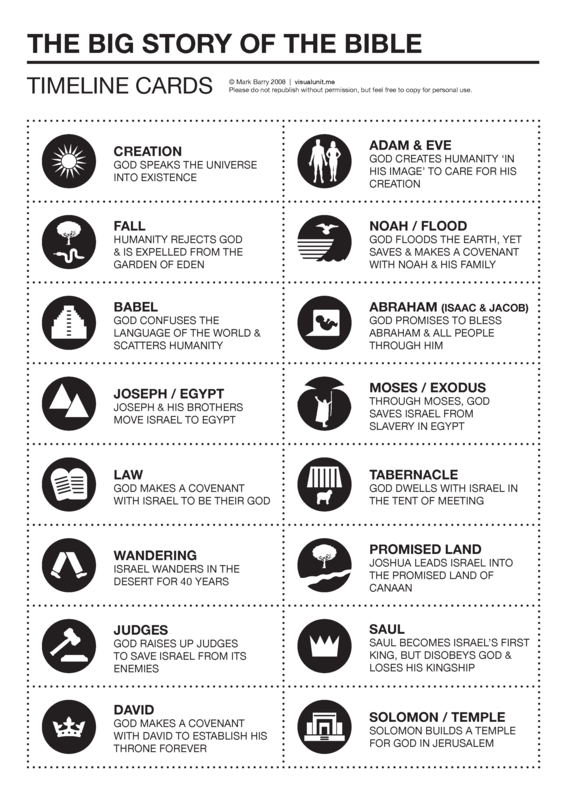 However, I don’t understand the omission of the estimate dates from Creation to Babel in your Bible Timeline chart? Given the genealogy in years from Adam to Noah in Gen 5 and Shem to Abram in Gen 11:10-26? Hi Werner. Honestly, the basic reason for the omission was to avoid the debate about dating altogether, and create a resource that all Christians can use, regardless of their position on this. Feel free to add the dates in as you see fit. Hi, Mark! I absolutely love your work! I just discovered all this christian infographics online. I am a pastor i a church in Norway working especially with youth. 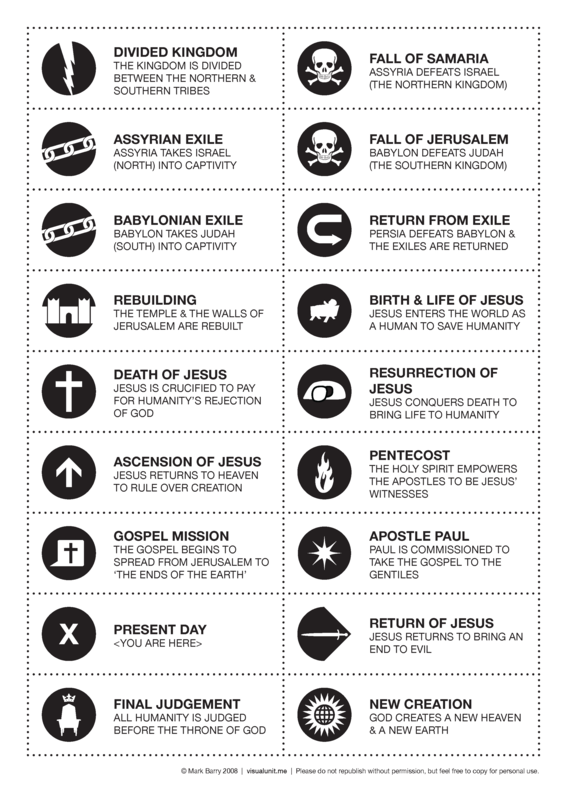 The infographics could be so helpful to grasp the history, event, characters and theology. Have you considered adding the biblical references to these events? That would have been nice when they are used for teaching others. Maybe you could have used the left column for the event, illustration and description. And then use the right column for biblical reference(s)? Or maybe just making to extra pages so it could be possible to print on both sides?… I am just excited about how this could be a great tool for teaching others! Have you considered making an infographic about the apostolic creed? I would have loved that! I tried to make a kids friendly creed in Aobde Voice: http://voice.adobe.com/v/S9JXk4tfh4f. But it would have been cool having the creed in the format of this Lord´s prayer: http://ymi.today/2014/03/36310/. Would you allow me to translate this into Norwegian? It is a great tool and I would love to make it more accesable to people, especially kids/youth, in my country. I can provide the translation and then you could add it to your site. Thank you for your hard work. May God continue to bless you abundantly. I’ll send you an email, Andrew.